Five Points is where Glenwood Avenue and Fairview Road make an x. Whitaker Mill Road terminates at the x, making 5 points. Glenn Ave. also terminates there, but nobody knows where Six Points is, making it pointless. The streetcar line and park are long gone. The carousel now resides in Pullen Park. The neighborhoods still remain and are some of the most desirable Inside-the-Beltline locations. There are quite a few subdivisions in the Five Points neighborhood. I have selected five groups for which I looked at 2015 closed sales of attached and detached homes. The results are below and portray what you can expect to find in the different areas of this interesting neighborhood. One thing to notice is the very short median number of days these homes stay on the market, and the close relationship between prices asked and paid-indicators of desirability. Five Points-Fairview Row. New Condminium. See the link. The Raleigh Historic Development Commission continues its discussion of Five Points (See Above) with a more in depth look at Hayes Barton. For desktop users, the spatial map above does not display the Hayes Barton subdivision as such. Hayes Barton generally includes the area west and east of Glenwood which is south of Five Points. It includes the west side of Fairview Road which is north of Five Points. Hayes Barton is north of Wade Avenue. Triangle MLS lists Hayes Barton, and the streets included a few that don’t conform exactly to the Five Points neighborhood boundaries on the map above, but you will get the idea and can expand the map to include an enlarged area. Two were less than $550,000, and the rest ranged up to $1,816,350. Nine sales were over $1 million. These two areas run on either side of Glenwood immediately north of Five Points, and include the areas along White Oak Road just north of Five Points. Glenwood Avenue is a busy street, and you may wish to consider that if looking at houses with a Glenwood address. Per Triangle MLS, there were 14 sales in 2015. One sale was $1,125,000 for a home built in 2014 on Breeze Rd. The rest ranged from $300,000. to $775,000. and were built during the period 1922-1955. The range of days on market was 1-112, with both average and median market times of 32 days. 2 homes of 2400 and 2594 SF sold for $580,000 and $510,000, respectively. They were both located on The Circle. 4 homes ranging in size from 2385 to 4189 SF sold for $625,000 to $665,000 The largest was the least expensive, and the smallest was the top price in the range. Two were on Sunset Dr.
1 home of 3295 SF sold for $775,000. It was on Sunset Drive. 1 home of 4,555 SF sold for $1,125,000. Roanoke Park, Vanguard Park, Georgetown and Hi Mount run along either side of Whitaker Mill Road to Wake Forest Road. Triangle MLS shows there were 51 sales in these areas in 2015, all detached dwellings. Average market time was 56 days, with the median at just 23 days. 27 had less than 2,000 square feet with prices ranging from $101,000 to $380,000. There were 15 sold between 2,000 and 3000 square feet, with sales prices from $339,500 to $627,500. Of the remaining 9 homes, all over 3000 SF, one sold for $315,000. The rest ranged from $610,000 to $770,700. 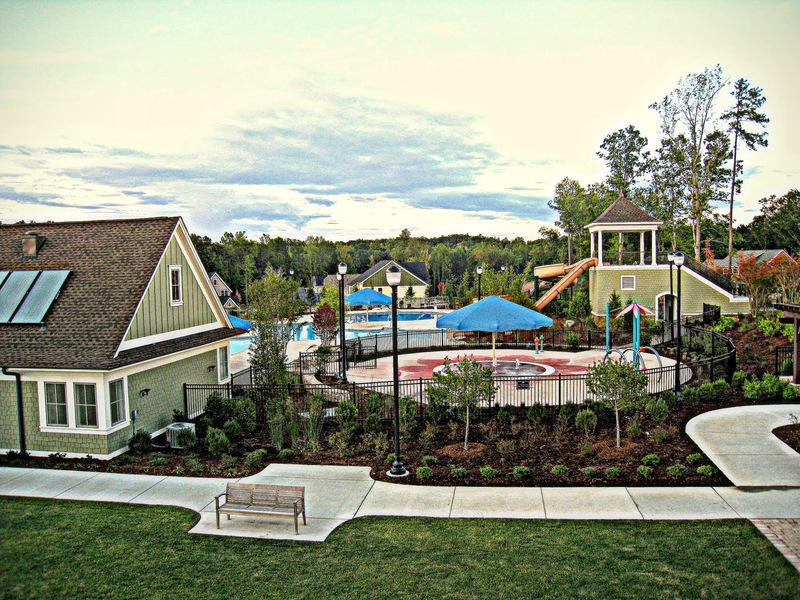 These neighborhoods lie north of Whitaker Mill Road and include new infill development at The Oaks at Fallon Park and The Grove at Fallon Park. Fallon Park is a City Park with 10.3 acres with open and wooded areas and the picnic shelter shown. The park follows a stream that runs along Oxford Road in Oxford Park and Royster St. in Anderson Heights and is a focal point for this area. Several of the subdivisions bear its name. The Joyner Elementary Magnet School on Lowden Street adjoins the area. Next to the school, with frontage on Noble Road is Kiwanis Park . (See the City of Raleigh link). This park also lies along Crabtree Creek and is crossed by the same creek draining Fallon Park. There is a neighborhood Center with a warming kitchen available for rent. There is a picnic shelter, outdoor basketball and volleyball, a baseball field, and a playground. There were 70 sales in 2015, and The Grove at Fallon Park, still being completed in 2016, accounted for 44 of those sales. MI Homes is developing this attached residence project with 2015 sales running from $359,990 to $451,828. Square footages ranged from around 2,000 SF to 2800 SF. This is one of the best opportunities we’ve seen to be in a new Inside-the-Beltline subdivision, especially Five Points, at these prices. The adjacent Oaks at Fallon Park are much more complete, and there were 5 sales of detached residences from just less than 3,000 SF to over 4,500 SF there in 2015. Prices ranged from $700,000 to $950,000 in what is essentially the same location as The Grove, but a different product type. For the area as a whole, days on market ranged from 0 to 442, the longest times affecting the 77 day average. The median market time was 24 days. My thought is that the large number of sales of new homes shows up in these average and median numbers, because there may not be as much room for negotiation, and extras get added during construction. This area is just north of and very convenient to the Downtown Glenwood South District. It runs north of Peace Street to Wade Avenue, and lies along either side of Glenwood. There were 11 sales in 2015 with average market times of 43 days, and median times of 20 days.